Living in Rome: Last chance to see stunning Titian exhibition at the Scuderie del Quirinale – Final weekend! Last chance to see stunning Titian exhibition at the Scuderie del Quirinale – Final weekend! If you're heading to Rome this weekend be sure to set aside a couple of hours to visit the Scuderie del Quirinale and be dazzled by the paintings of Venetian Renaissance master Titian (in Italian Tiziano Vecellio) on display until Sunday. Presented as the final chapter in a series of excellent monographic shows held over the last few years at the Scuderie del Quirinale looking at the work of Italian Renaissance painters - Antonello da Messina, Giovanni Bellini, Lorenzo Lotto and Tintoretto - this analysis of Titian brings the cycle to a stunning conclusion. 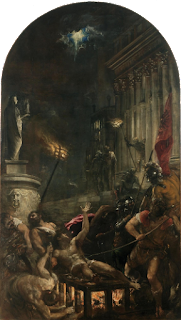 There are no also-rans in this show - this is a world class exhibition of 39 important paintings by Titian, with loans from major museums both in Italy and overseas. The lower floor of the Scuderie del Quirinale gallery is spacious enough to hang even the largest of monumental paintings, and it is on this floor that we find most of the religious paintings in the show. Indeed, the very first painting the visitor sees in the first gallery is a late altarpiece, the recently restored Martyrdom of St Lawrence (1547-1559), an extraordinary study in light and color, and truly gruesome execution scene. In the same room as this altarpiece we find the sombre Prado Titian Self-Portrait (1565-1566), a portrait of the artist as an old man. Two paintings into the show, and already the enormous influence and legacy of Titian is apparent, as one is fleetingly reminded of Rubens, Caravaggio, even Manet, and of course Rembrandt. 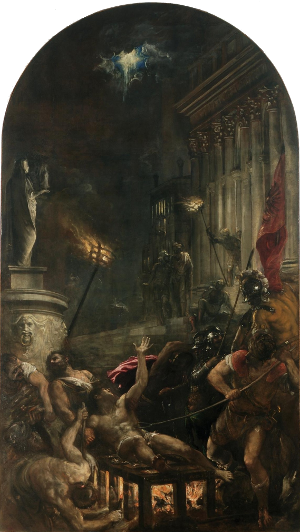 Colour and light may have been Titian's driving concerns, but what emerges from this show is the way he employed them in the service of the story being told. 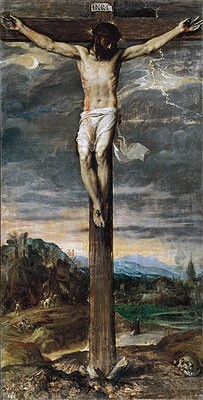 A chilling white light bathes the dying Christ in the El Escorial Christ Crucified (1555-1557), as lightning rends the thunderous sky, and the slither of a crescent moon breaks through the clouds, yet in the background a warmer sunrise lights up the distant mountains. The deathly pallour of the dead Christ in the Prado Deposition of Christ in the Sepulchre (1559) in the following room is heightened all the more by the luscious vermillion of San Giovanni's clothes and the Vigin's lapis lazuli cloak, whilst the sheer bulk of Christ's dead body is rendered in loose, broad brush strokes. Almost the entire upper floor of the Scuderie is dedicated to my favourite aspect of Titian's output – his work as a portraitist – and it's here that I found myself spending the most time. In fact, I spent quite some time in front of one painting alone, the Portrait of Ranuccio Farnese (1542). 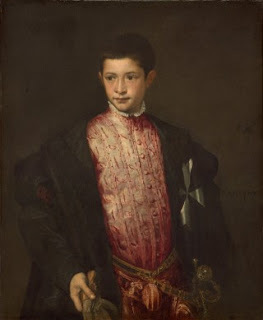 Utterly beautiful and strangely poignant, this portrait pictures the 12 year old boy in the ill-fitting costume of the adult office recently thrust upon him (he had just been made prior of the Knights of Malta and would become Archbishop of Naples at 14 ). The portrait marked the beginning of Titian's long association with the Farnese family and, in particular Pope Paul III, whose engaging portrait is in the first room of the upper floor. The Louvre's enigmatic, Man with Glove (1524-1525) is yet another showstopper. The final room features another late Self-Portrait (c.1562) and a final bravura work of quite astonishing brushwork by the elderly Titian, The Flaying of Marsyas (c.1570-1576), which comes as a genuine shock after the gently sublime portraits of the previous rooms. Tiziano is curated by Giovanni C. F. Villa , and continues at the Scuderie del Quirinale until 16 June 2013. Image usage note: web-resolution, fair use rationale on all images.